FILE - A fighter from the Islamist Syrian rebel group Jabhat al-Nusra is seen in front of a burning vehicle, caused by what activists said were missiles fired by a Syrian Air Force fighter jet, in Raqqa province, east Syria, May 12, 2013. Al-Qaida’s affiliate in Syria is building a larger base of support among insurgents in the war-torn country, and is having some success in persuading regional governments that it should be seen as a useful partner, by marketing itself as the moderate alternative to Islamic State extremists, a forthcoming study claims. 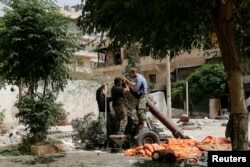 By restraining its fighters from enforcing as strict a Sharia law code as the Islamic State group and developing ties with Islamist rebel militias, Jabhat al-Nusra is becoming an “organic part” of communities in insurgent-held areas, the study argues. The gradualist strategy of disguise, and cooperation with other militant organizations, contrasts with the boastful and indiscriminately violent path by Islamic State extremists as jihadist groups vie for the loyalty of extremist affiliates and offshoots. "Nusra and the Islamic State have adopted very different public images,” said Daveed Gartenstein-Ross, a counterterrorism scholar and lead author of the study, "The War between the Islamic State and al-Qaida." FILE - Rebels from al-Qaida-affiliated Jabhat al-Nusra, also known as the Nusra Front, wave their brigade flag, as they step on the top of a Syrian air force helicopter at Taftanaz air base that was captured by the rebels in Idlib province, northern Syria, Jan. 11, 2013. “While the Islamic State constantly projects an image of strength, and flaunts its overt brutality as a demonstration of its ability to impose its will forcefully, Nusra attempts to appear moderate in comparison, a jihadist organization that other militant groups, and Middle Eastern states, can do business with," Gartenstein-Ross told VOA. "But the image Nusra seeks to project does not match the reality,” he said. Al-Nusra’s mask of moderation slips regularly in Syria, where its fighters enforce a phased implementation of its hardline version of Sharia, but unlike the Islamic State group, it does not gloat about the cruelty of its fighters or promote them heavily online. With international media attention so fixed on its rival extremists, al-Nusra’s harshness has been increasingly overlooked. Last week, activists who wanted to illustrate al-Nusra’s violence posted online a series of photographs documenting the grisly slaughter of 56 Syrian government troops captured in Idlib province by the jihadist group’s fighters and allied Islamist militias. Photographs show soldiers lining up awaiting execution or being shot after being ordered to lie down. FILE - Former CIA Director David Petraeus testifies on Capitol Hill in Washington before the Senate Armed Services Committee hearing on Middle East policy, Sept. 22, 2015. 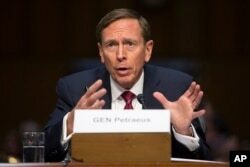 The images were posted just days after retired U.S. General David Petraeus, a former CIA director, triggered a debate among Western officials and analysts by suggesting some al-Nusra fighters could be co-opted to join the international coalition’s fight against the Islamic State group. He based his argument on his experience in the 2006-2007 surge in Iraq that included the decision to work with some Sunni Muslim militants to help stabilize the country and fight al-Qaida in Iraq, the forerunner of the Islamic State group. But the study by Valens Global, a Washington-based threat assessment consultancy, suggests such a peeling off could give the group more opportunities to infiltrate militias and ingratiate itself with locals. While the Islamic State group is quick to announce when affiliates declare their allegiance, al-Qaida has been stealthier, hoping to “reduce the organization’s exposure to counterinsurgent forces, including the United States … and to avoid frightening or alienating local populations,” the study argues. The study says the re-branding may better position al-Qaida for long-term survival, while the Islamic State group attracts more heat and flames out. “Jabhat al-Nusra has even convinced some U.S. allies, including Qatar, Saudi Arabia and Turkey, that it should be viewed as a partner in the fight against both IS and also Bashar al-Assad’s brutal regime,” it says. Al-Nusra’s popularity among fighters with some of the most powerful rebel militias -- grouped together in an effective alliance called the Army of Conquest -- has presented U.S. war planners with a dilemma in the West’s intervention in a highly complex battle with multiple fronts involving the Syrian regime, Islamist, and more moderate rebels, jihadists and Kurdish forces. The United States has unleashed warplanes against al-Nusra only a few times in the past year, despite fearing al-Qaida veterans based in Syria are planning terror attacks in the West. Some U.S. intelligence officials have urged the administration to avoid airstrikes on al-Qaida’s affiliate in Syria to avoid fighting a broader war against al-Nusra forces and risking further alienation of Syrian civilians in rebel-held areas who see the group’s fighters as the most effective of the insurgents ranged against President Assad’s forces.